It’s no secret that the VA health care system is complicated. With exemptions, applications, requirements, and more getting the treatment, that you or a loved one deserves can be difficult. Adding to this already complicated process is your assignment to a priority group. In addition to our work with the VA Aid and Attendance Pension, we at Patriot Angels are frequently asked about priority groups, and what they mean. Today, we hope to make these groups more understandable with this guide. When you enroll in a VA health care program, you are assigned a priority group. There are eight different groups, each made up of veterans with different levels of needs and requirements. The VA created these groups as a way to help meet the demand for VA services. Essentially, an individual’s priority group is assigned based on the level of care a veteran needs, and how much it will cost the VA to treat them. The number of veterans in each priority group, and how many new veterans can be moved into a priority group is determined by the amount of money the VA has available to them. Depending on your priority group, your copay will change when using VA health services. This priority group is comprised of veterans who have a service-related disability that has left them 50 percent or more disabled. Similarly, if a veteran has been determined to be unemployable due to a service-related disability, they are placed in Priority Group 1. Veterans who have been placed in Priority Group 2 have been determined to have a service-related disability that has given them a 30 percent or 40 percent disability rating. Priority Group 3 is made up of several veteran statuses and classifications. If a veteran was a former prisoner of war or received a Purple Heart medal, they are assigned this group. Veterans who were discharged for a disability that was sustained or made worse by their time in the service are also placed here. For veterans with a 10 to 20 percent disability rating, they are also in Priority Group 3. Finally, if a veteran has been awarded a special classification under Title 38, U.S.C., Section 1151, they are positioned in this group. For those veterans who are already receiving financial assistance from the VA Aid and Attendance Pension, or other housebound benefits, they will be placed in Priority Group 4, along with veterans who have been recognized as catastrophically disabled. If you are a non-service-connected veteran, with non-compensable service disabilities rated as zero percent, and if your annual income and net worth are less than the VA benefits national income threshold, you will be placed in Priority Group 5. If you are already collecting a VA pension or are eligible for Medicaid programs, you’ll also be in this Priority Group. Priority Group 6 covers a wide variety of veterans across many wars and time periods. Generally, if a veteran has a compensable service, with 0 percent disability, they will be placed here. If the veteran was exposed to radiation as part of the atmospheric testing of atomic weapons or occupation of Nagasaki and Hiroshima, they are placed here. Similarly, veterans who were exposed to chemical agents as part of Project 112/SHAD are in Priority Group 6. Veterans who were discharged from active duty on or after January 28, 2003, who enrolled as of January 28, 2008, and veterans who apply for enrollment in VA health services after January 28, 2008, are placed here. 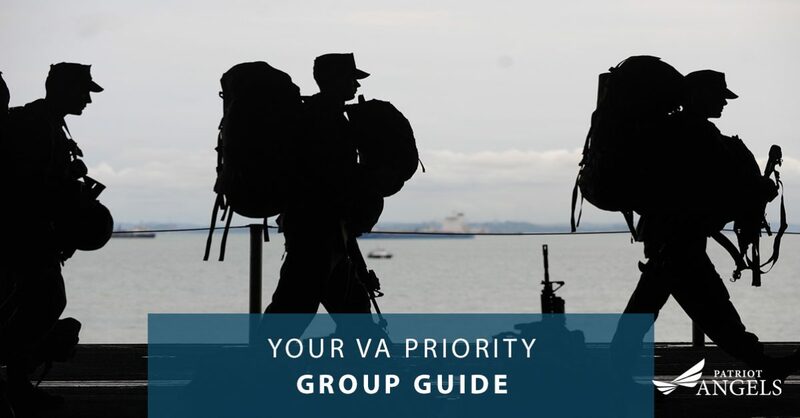 Priority Group 7 is made up of veterans who have an income, or net worth, that is above the VA national income threshold, but whose income is below the geographic income threshold. These veterans have also agreed to pay co-pays as part of their treatment. The final Priority Group consists of veterans who have an income or net worth that is above the VA national income threshold and the geographic income threshold who also agree to pay co-pays. Within this group that are four sub-priority classifications, A, C, E, and G, that are each tied to a discharge or enrollment date. If you or another veteran are seeking long-term medical care assistance, you may be eligible for the VA Aid and Attendance Pension. This pension can be used to offset the costs associated with your care. Contact the Patriot Angels today and arrange for a free consultation. With years of experience, we can help you to collect these funds for your care or the care of a loved one.